Villa Lotus Choeng Mon is a luxurious three-bedroom holiday villa on the pristine white-sand shores of Choeng Mon beach, Koh Samui. Experience the surreal beauty of its spotless white interiors and exterior complemented by cascading green tropical flora and turquoise blue waters of the swimming pool. Nearby guests have easy access to intriguing sites such as the Wat Plai Laem, Big Buddha Bophut and Fisherman’s Village. 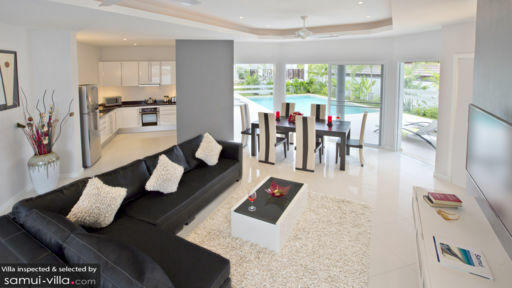 The villa itself caters to all your needs with comfortable and modern amenities to make you settle in with ease. 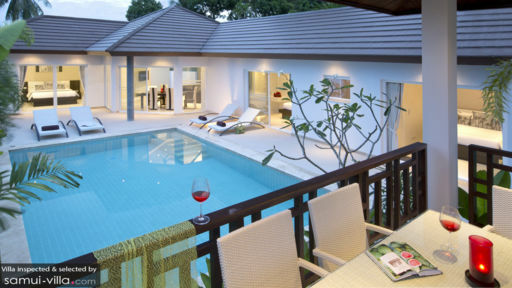 Villa Lotus Choeng Mon is home to three poolside bedrooms with glass doors that will take you directly to the pool deck. This allows for resplendent views as you wake up on your comfortable king-sized bed that guarantee a good night’s rest. The interiors are minimal and dominated by a similar white-theme to focus more on the outdoors. You have luxe bedrooms all to yourself with amenities like work desks/ dressers, air-conditioning and ensuite bathrooms. Other facilities offered include slatted wardrobes, toiletries and bathrobes as well as ceiling fans for proper ventilation. As you enter through the wooden doors of Villa Lotus Choeng Mon, you will be greeted by the luscious sight of its beautiful swimming pool and lush flora that borders the periphery of the villa. A sand-washed pool deck houses several sun chairs for lounging, sunbathing and even taking an unplanned afternoon nap. What’s a tropical vacation without a few cocktails and endless coconut water? The elevated poolside sala is the ideal spot for some drinks and appetisers during the magic hour as by then you will experience the cool evening breeze. The asymmetrical architecture of Villa Lotus Choeng Mon helps is utilising maximum space and ensuring that each individual indoor pavilion opens directly to the swimming pool. The living and dining area is well-lit and abundant ventilated owing to the glass doors that can be left open. If you wish for a cooler ambiance, then the air-conditioner is your saving grace. Furnished with a lavish sectional facing a wall-mounted Smart TV, the living area is a great place to relax and let loose with your loved ones. The entire space is swathed in white which is cool and soothing amidst the hot, tropical climate. The six-seater dining table stands right by the poolside as well so you can have access to plentiful views while you’re relishing a delicious meal indoors. The monochrome interiors add to the elegance of the living space that is heightened by the lush natural colours outside. Finally, you have the fully-equipped kitchen that is designed in true, western-style with built-in oven for fresh bread with your breakfast and other modern amenities for your use. To ensure your stay is smooth sailing, Villa Lotus Choeng Mon has an entire on stand-by catering to services such as housekeeping, maintenance and security so that you can rest easy knowing everything is in good hands. You can enhance your travel experience by availing paid services such as massages, car rentals, airport transfers and others. Explore the hidden gems around Choeng Mon beach where you may happen upon a stranded white-sand beach with the most beautiful views. One such place is Thong Son Bay beach with its dazzling shores where you may be able to go snorkelling. Ancient temples and cultural experiences are plenty in the area including a visit to the Big Buddha Bophut and exploring the shop-houses at Fisherman’s Village. Chaweng beach with its cohort of restaurants and cafes is also close-by.